Our goal is to help you feel as comfortable as possible. New patients often remark about how homey our office is. That’s good, because we aim to offer state-of-the-art chiropractic care in a comfortable surrounding. So, have a cup of tea and make yourself at home! 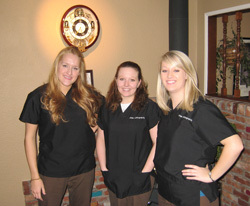 You will be greeted by one of our helpful staff members who will present your initial paperwork. You will then be guided to the consultation / examination room, where you will meet with the doctor. The purpose of your initial consultation is to discuss your health goals and see if you are a chiropractic candidate. If so, the doctor will proceed in performing a thorough examination. The examination will help identify the cause of your problem. If Dr. Matsuno feels that a different approach is more appropriate, he will make a referral or recommendation at this time. Patients appreciate that we explain everything in advance! 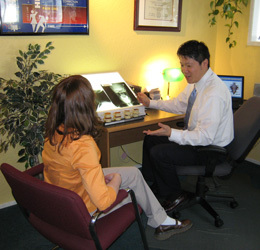 Dr. Hiro reviewing examination findings with a patient. The examination will consist of several assessments to aid Dr. Matsuno in locating where you have disturbances in your nervous system or other problems. We use state of the art technology such as electromyography (computer muscle activity analysis) to accurately assess your condition. If X-rays are needed, they are done right in our office. They can be used to reveal the structure and alignment of the spine and further confirm other examination findings. Dr. Matsuno will meet with you and discuss in depth the results of your examination. He will also recommend a treatment plan and discuss costs at this time. Any questions or concerns that you have will be addressed. Each patient’s condition and needs are unique and are treated as such. Sometimes care can begin right away. Other times, test results may require a more detailed analysis or coordination of information from several different tests / sources. In these cases, we will most likely schedule a second visit to review the findings in detail with the doctor. We are very sensitive to the immediate pain relief needs of acute and severe conditions. The front desk will assist you in scheduling a time for your second visit…usually the next day! Ready to get started? Call now to schedule an appointment!